The British summer time is here. The murky skies are now giving way, on Occasion to blue sky and some glorious weather. Every Brit loves to enjoy the summer to the full, and when there is a family involved nothing gives quite as much joy and fun as a splash in the water in the family paddling pool. With temperatures on the rise this week we have found what we consider to be the top 5 paddling pools. Gone are the days where choice was limited to just 2 or 3 now the market is awash with paddling pools that are more like swimming pools and those which incorporate soft play and water slides into their design. We have chosen a selection for you to look at. So let’s dive in! This paddling pool sold by amazon comes in at a surprisingly reasonable £27.29. The pool at 8ft is large enough to fit the whole family and a Lilo in if the fancy took you. The pool is constructed with thick layers of plastic and an inflatable ring around the top. It is only this part that needs inflating and then by filling the pool with water the sides rise up to form the paddling pool. The only downside it seems is that it requires a completely flat surface to be successful and without this the water spills out easily. Also the price does not include a pump or a cover, two essential items that are needed with this pool. Other than that is seems the ideal choice for family fun. 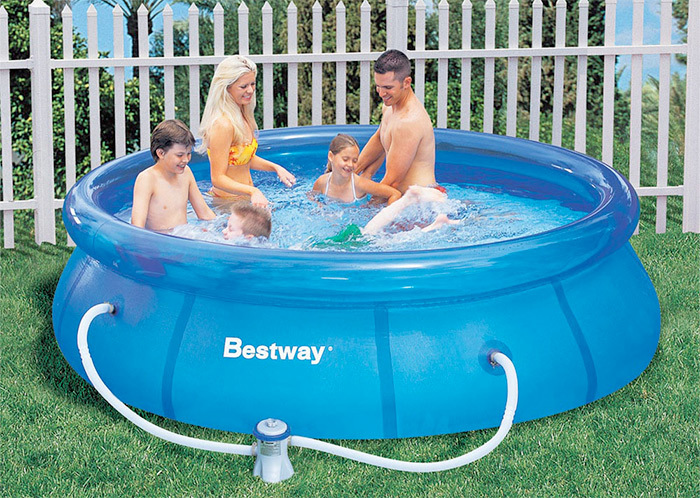 In at number 2 is another pool made by the Bestway company. This pool is more for paddling and splashing rather that swimming and is aimed at younger children. 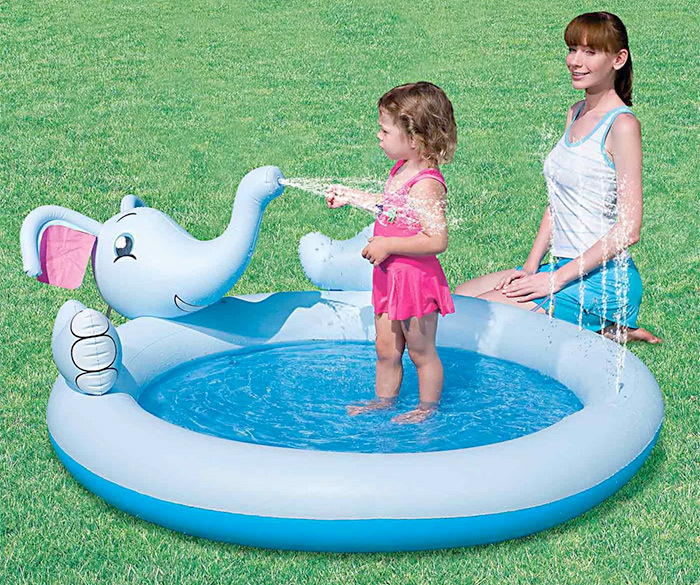 This again is an inflatable pool but has water squirting from the elephants trunk and a sprinkler system which can be attached to the garden hose. Again found on amazon at £19.99 it is another winning price but definitely not a pool if the whole family want to get in on the fun. In order to find the best value we have looked to the supermarkets. Sainsbury’s have a paddling pool and ball pit combination. 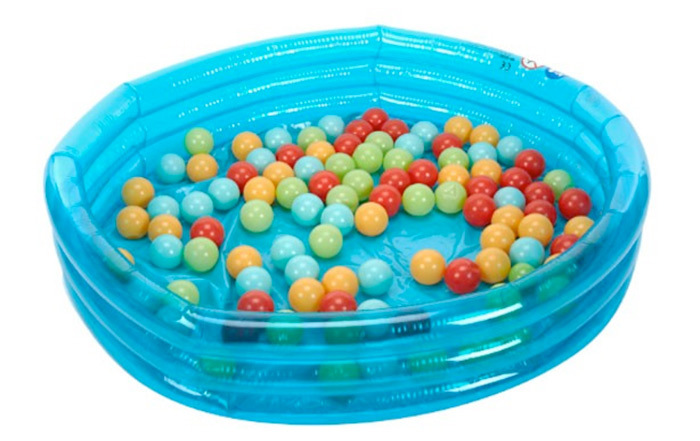 The pool coming in at just £7.99 and the balls £5. The beauty of this pool is that it can be put to use even when it isn’t paddling pool weather. And let’s face it those days are few and far between, so if it’s a cheap and cheerful option you are after the this is he one for you. 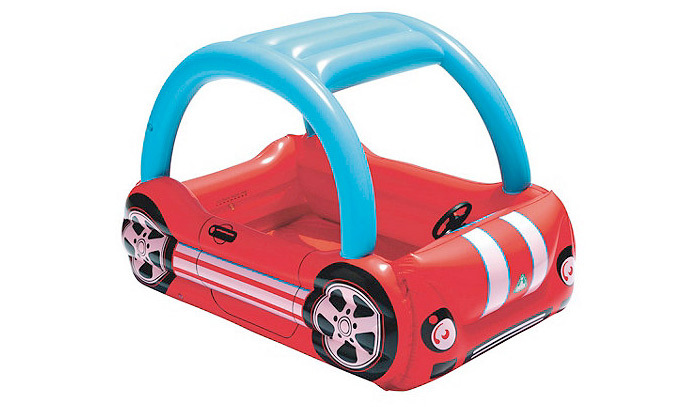 If it’s a novelty swimming pool that you are after then look no further than the ELC car swimming pool at £20. With dimensions of 41x41x9cm it is big enough for small children to enjoy and the top of the car provides a great sunshade. All children love the world of make believe so what could be better than going on a drive on a hot summers day whilst splashing with their siblings or friends. The last paddling pool we have found at Daddy Geek combines the fun of splashing and sliding. The Chad Valley Splash Slide Rider sold by Argos at £31.99 has an inflatable slide which runs into a paddling pool at the bottom. Gone are the days of needing to wedge a slide into the bottom of the paddling pool, here all the fun is already together. An issue here seems to be the how sturdy the plastic itself is and there are a few complaints about rips in this pool, but on the whole the reviews were good and it looks like a huge amount of fun!! Whichever paddling pool you choose, enjoy, and make most the Great British summertime.